For the past few months, my children have enjoyed playing for hours at a time with their favorite PinyPon toys. Made by Famosa, a leading European toy maker, PinyPon is a creative toy line that features miniature dolls in a series of fun locations such as a PinyPon Snow Ski Lodge, PinyPon Hotel, PinyPon Shopping Mall and more. 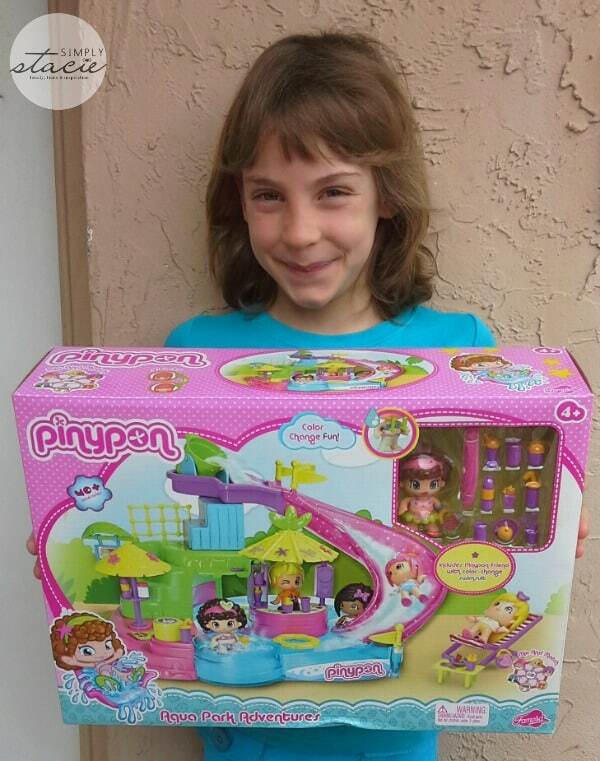 Hannah and her younger brother were very excited to learn about the latest PinyPon toy launch which is the perfect addition to our toy collection for spring and summer…..the PinyPon AquaPark Adventure (SRP $24.99). This newly released PinyPon toy has been a huge hit in our home as it features a working water slide, Jacuzzi tub and even a lazy river ride. What makes this PinyPon AquaPark Adventure Set so special is that when I sat down to put it together, Hannah stopped me and asked if she could build it by following the directions herself. She is in 1st grade and is looking for more independence so I let her build it while I was available to help her as needed. She was thrilled to build the entire set by herself (with a little help from her older brother) and I was beaming with pride watching my little girl do this all by herself. Once the set was build she was very excited to start playing…..and continued to play, for hours! 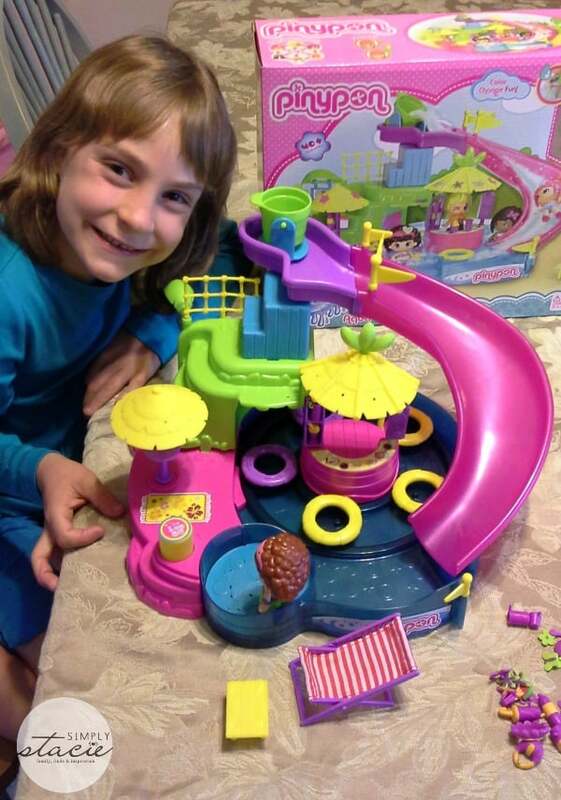 My daughter was delighted to learn that she could actually add water to the toy so that her new PinyPon friends could take a ride down the water slide, move around the working lazy river and even relax in the Jacuzzi tub with real water “bubble” action. 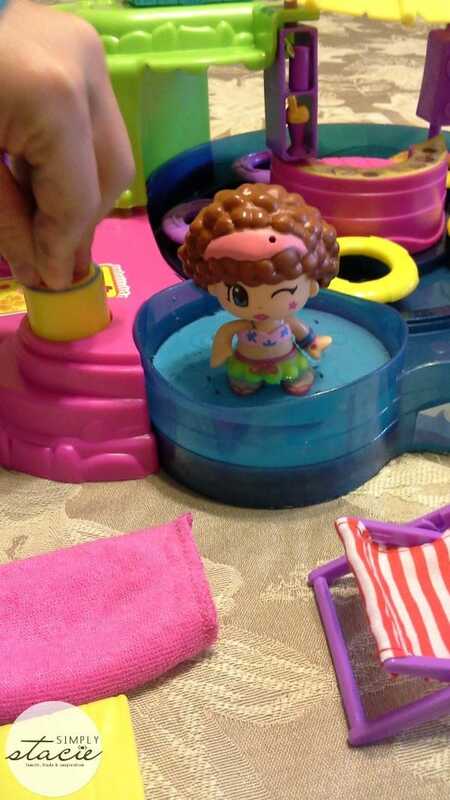 She got really excited and told everyone to come for a look when her little curly haired PinyPon doll actually color changed in the cool water. When the dolls are tired from their park adventure, the PinyPons then headed over the poolside restaurant for a snack and a drink. What makes PinyPon so appealing to my children is that each set features so many interesting little accessories and areas to explore. The PinyPon dolls are adorable and unique in that the children is able to mix and match all of the different heads, hair, mid-sections and feet to make completely customized characters. The PinyPon dolls and play sets are made with vibrant, appealing colors and I love that it is interconnected so that my kids can set up an entire PinyPon world. The interactive nature of these toys have encouraged role playing, cooperative play and tons of open-ended fun. 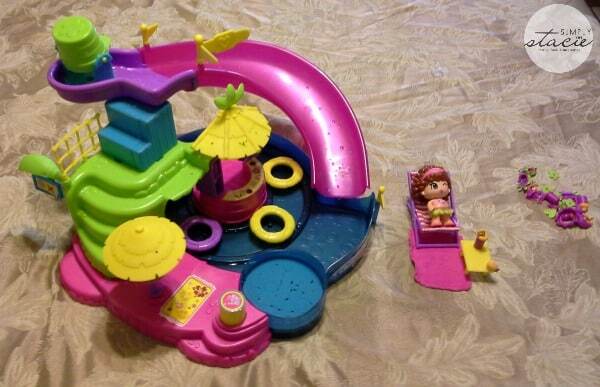 The PinyPon AquaPark Adventure Set is a well-loved toy in our home and comes with the rare curly haired PinyPon doll and a ton of accessories. You are invited to visit the PinyPon US website to learn more about purchasing this fun and exciting toy play set and check out all of the toys in the PinyPon world too! It is available for purchase at Amazon and additional retailers too. You can also connect with Pinypon USA on Facebook, Twitter and YouTube. Cool!! I want to get one to keep at my home for when my granddaughter comes over, I like this alot better than Polly Pocket, they are not as tiny and you can actually play with it, thanks so much for sharing, now I know what to buy!! My niece would love this wonderful colorful toy for her birthday.l I like how easy it is to set up and the adventure that she can have would be great. This looks cute! It’s been a boys world in my house for 16 years….girly stuff is taking some getting used to lol. this is adorable and no doubt gives tons of fun play. My granddaughter would love this I’m sure. Wow, this is a cool toy!! I am looking for a gift for my sons friend when he goes to her party this weekend, this would be an awesome idea! Thanks! How fun and cute! Love the bright colors. 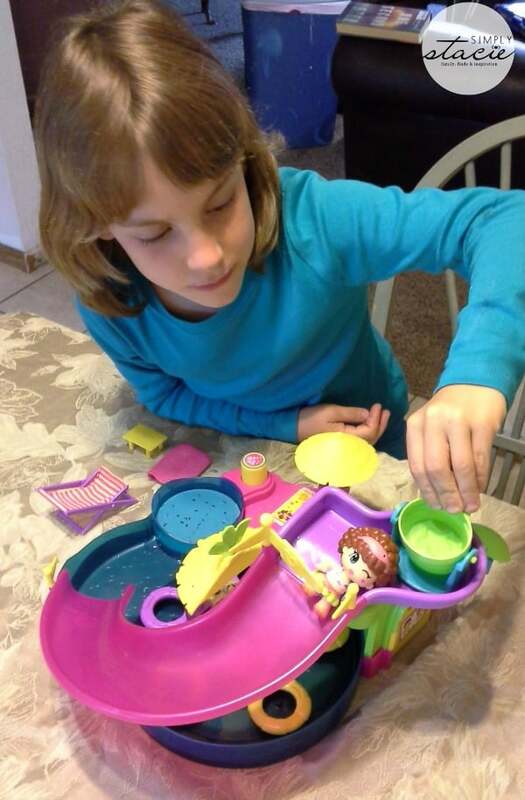 My daughter used to love her Barbie pool especially when we put water in it. I know my granddaughter would enjoy this. I had see the Ski Lodge, and I’m glad they have a water theme one too. Great review! My niece would love this toy! Cute!! My lit cousin would love this! This toy is too cute! bet my daughter would have fun playing with it too. I know I would! It’s like a much bigger version of Polly Pocket. This is adorable! I like all the little details, and can definitely see this being good for many hours of play. This sounds like a fun set that keep the children occupied for hours. It is wonderful that there are so many accessories and different activities. That is so incredibly cute! It would be a great gift idea for any little girl!